The New FSSP Church in Ottawa? If A Commission Spoke, What Should It Say? 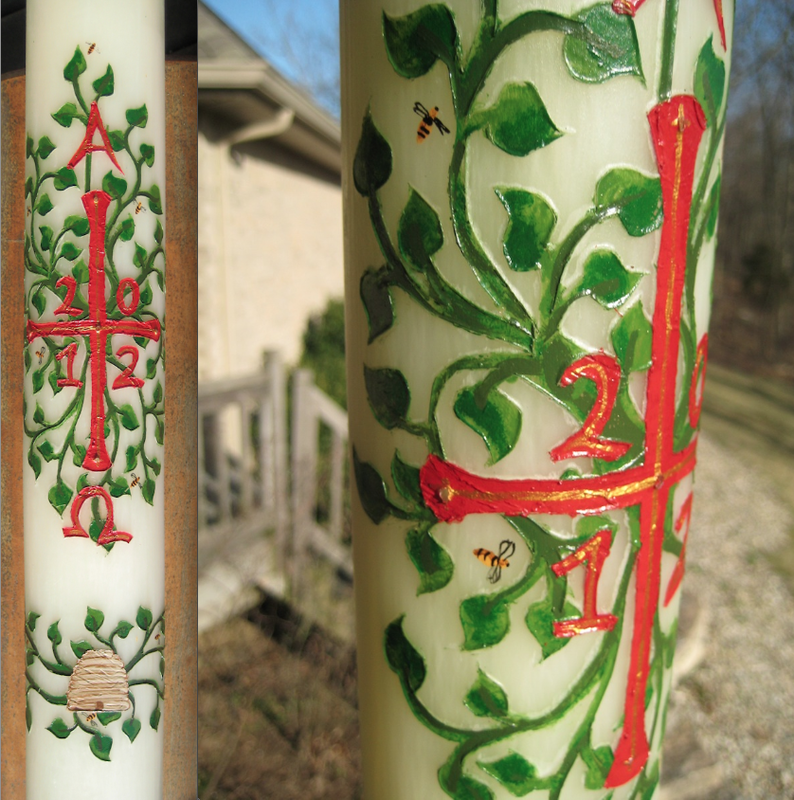 Recently one of our priests sent in some photos with a brief note about a Paschal candle that he, himself, undertook to design for his parish. 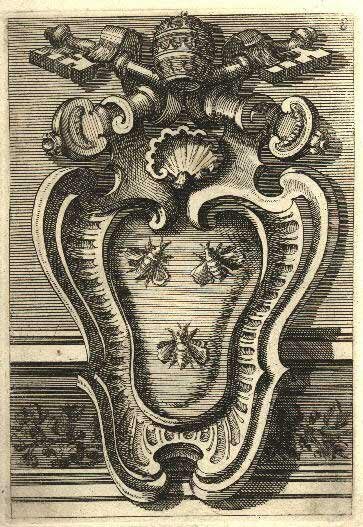 He commented to me that "in honor of the return of the bees to the Exsultet" he incorporated them into the design. These same references are, of course, to be found in the Exsultet within the usus antiquior. Your presence in such large numbers, your desire to assemble before Us, beloved sons, is a real comfort: and so We express our heartfelt gratitude for your homage and your gifts, both particularly pleasing to Us. Beyond its material and technical importance, the work which you represent, by its nature and significance has a psychological, moral, social, and even religious interest of no small value. 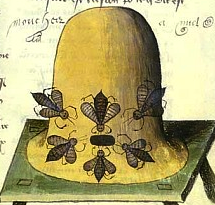 Have not bees been sung almost universally in the poetry, sacred no less than profane, of all times? Impelled and guided by instinct, a visible trace and testimony of the unseen wisdom of the Creator, what lessons do not bees give to men, who are, or should be, guided by reason, the living reflection of the divine intellect! Bees are models of social life and activity, in which each class has its duty to perform and performs it exactly—one is almost tempted to say conscientiously—without envy, without rivalry, in the order and position assigned to each, with care and love. Even the most inexperienced observer of bee culture admires the delicacy and perfection of this work. Unlike the butterfly which flits from flower to flower out of pure caprice; unlike the wasp and the hornet, brutal aggressors, who seem intent on doing only harm with no benefit for anyone, the bee pierces to the very depths of the flower's calix diligently, adroitly, and so delicately, that once its precious treasure has been gathered, it gently leaves the flowers without having injured in the least the light texture of their garments or caused a single one of their petals the loss of its immaculate freshness. Ah, if men could and would listen to the lesson of the bees: if each one knew how to do his daily duty with order and love at the post assigned to him by Providence; if everyone knew how to enjoy, love, and use in the intimate harmony of the domestic hearth the little treasures accumulated away from home during his working day: if men, with delicacy, and to speak humanly, with elegance, and also, to speak as a Christian, with charity in their dealings with their fellow men, would only profit from the truth and the beauty conceived in their minds, from the nobility and goodness carried about in the intimate depths of their hearts, without offending by indiscretion and stupidity, without soiling the purity of their thought and their love, if they only knew how to assimilate without jealousy and pride the riches acquired by contact with their brothers and to develop them in their turn by reflection and the work of their own minds and hearts; if, in a word, they learned to do by intelligence and wisdom what bees do by instinct—how much better the world would be! Working like bees with order and peace, men would learn to enjoy and have others enjoy the fruit of their labors, the honey and the was, the sweetness and the light in this life here below. Instead, how often, alas, they spoil the better and more beautiful things by their harshness, violence, and malice: how often they seek and find in every thing only imperfection and evil, and misinterpreting even the most honest intentions, turn goodness into bitterness! Let them learn therefore to enter with respect, trust, and charity into the minds and hearts of their fellow men discreetly but deeply; then they like the bees will know how to discover in the humblest souls the perfume of nobility and of eminent virtue, sometimes unknown even to those who possess it. They will learn to discern in the depths of the most obtuse intelligence, of the most uneducated persons, in the depths even of the minds of their enemies, at least some trace of healthy judgment, some glimmer of truth and goodness.